Leon was born, raised and educated in London, beginning his career in the arts at a very early age. Mathematically and mechanically inclined, he designed custom furniture for his family business whilst pursuing a degree at art college. Using this as a springboard, he worked as a stonemason, developing a skill for cutting and polishing stones such as marble, eventually graduating to his present medium of metal. Immigrating to America in 1986, Leon opened his studio in Culver City, California where he worked closely with the interior design industry. 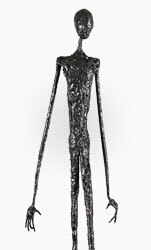 Inspired and supported by some of Los Angeles' leading decorators, his sculptures became sought after worldwide. His flair for design and spontaneity of thought have led Leon to create a wide varied of work, ranging from private residential commissions to commercial installations. His past clients include Claridge’s, the Imperial War Museum, Chateau Marmont and Sharon Osbourne. Infinitely impassioned by the action of flame to metal, Leon uses no foundry. 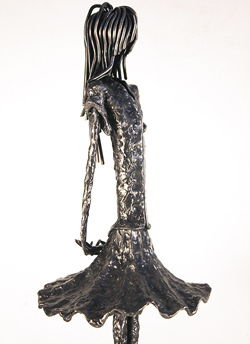 Preferring to forge each of his pieces himself using the naked flame, each sculpture is a distinct original. Solid steel rods of various diameters are used to structure basic skeletal forms. Layers are then added by heating molten balls of steel, which are slowly fused to this form, giving substance and shape to each sculpture. As rod after rod is liquefied and moulded, each individual work is gradually brought to its unique completion. 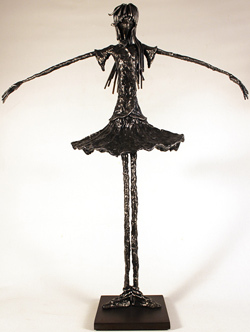 After nearly thirty years of living and working in America, Leon has now moved his studio from Los Angeles back to England, where he continues to produce contemporary sculptures that embody his fiery imagination. Please note that all Leon Leigh art listed in this section has previously been displayed for sale and is not currently available.